In the aftermath of the Jammu and Kashmir floods, Mrs. Dulari Bhan was stuck inside a home on Srinagar’s Exchange road for seven days. 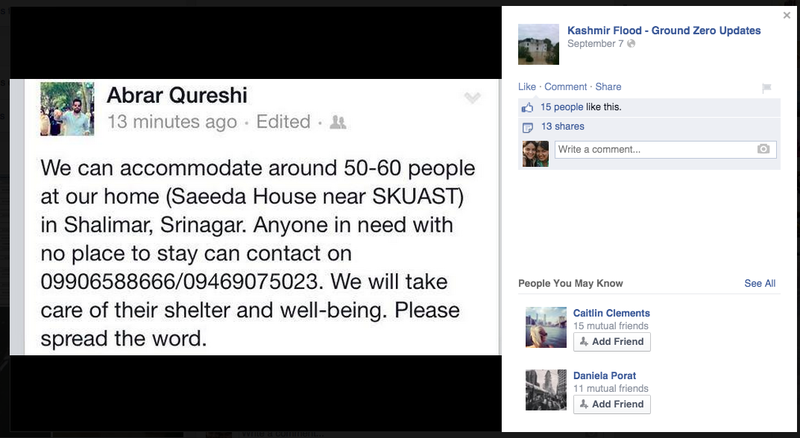 When help finally came, it was from the team of Rising Kashmir, a regional newspaper. 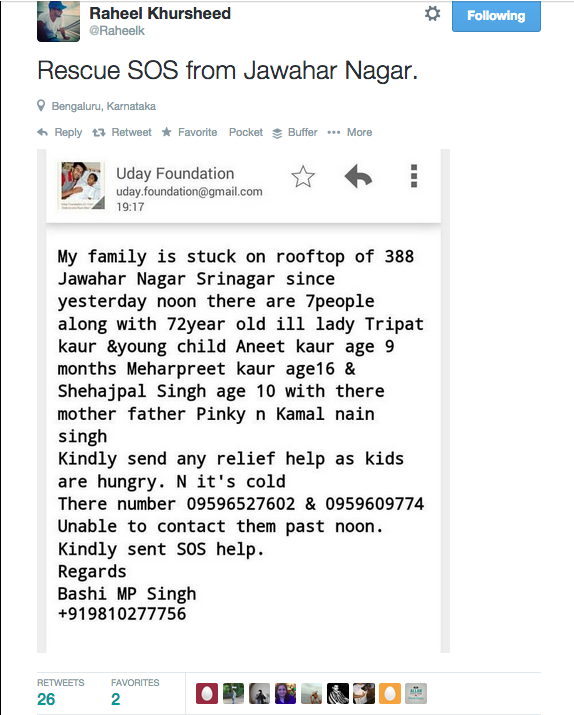 Their rescue team had reached after receiving a tip via a tweet from @Raheelk of Twitter India. This is just one of the several #SOS messages that emerged on social media and through action by the government and other groups on ground resulted in saving lives. One such group is JKFloodRelief, that was started by a group of ten including members of Twitter, Uday Foundation and Goonj on the 6th of September. 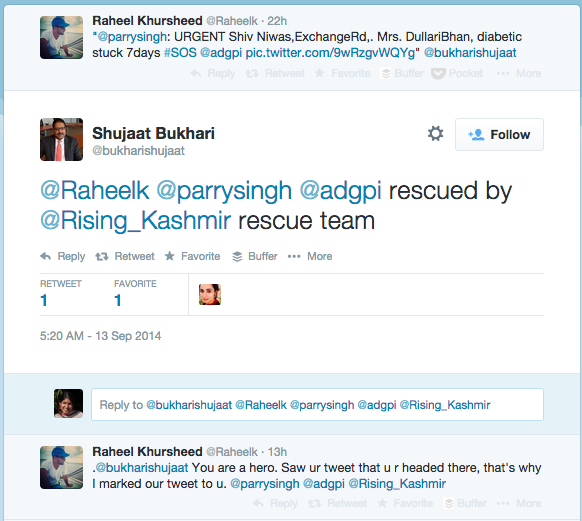 With the help of Twitter’s data team, they created a smartfeed of SOS messages with the hashtag #KashmirFloods. The smartfeed has been able to provide 12,000 rescue leads for the Indian Army, who themselves have also been extremely active on social media. 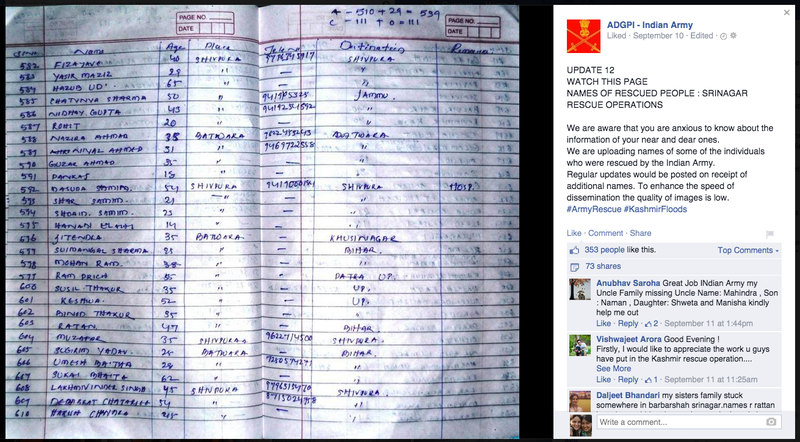 The @adgpi account on Twitter has been constantly pushing updates about the rescue operations. On Facebook, the department has been publishing lists of rescued people for those who haven’t heard from their friends and family. As the restoration of cell phone towers goes underway, the Central Government has deployed WiFi in public spaces to enable the use of social media and online channels for people to reach out. With people reaching out to organisations on social media, retweets and shares have been spreading the word about those missing. 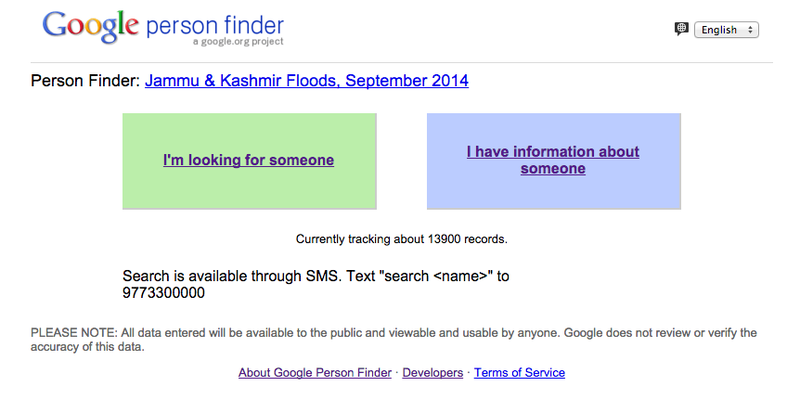 Other data based operations include the Google Person finder that has been used in the past globally during disasters. Users can add a missing person, someone that they have found and search people in both the groups. The database has around 13,900 records at present. The biggest game changer that social media has brought in the relief operations of the Jammu and Kashmir floods is the presence of the volunteer. Everyday people are coming together, forming collectives and reaching out to people who need help. For instance, a man offered shelter to those in need for a place to stay. Social media has ended up as a tool that everyone is harnessing to help each other. 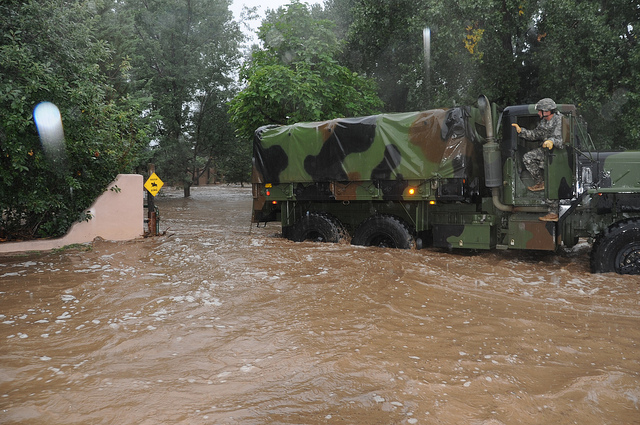 While the army is using it to track people and ensure that people are being rescued, civilians are taking initiative and using these tools to collect resources. Snapchat breaking barriers with world leaders! Why brands need to tap on the power of regional social media now?